For many businesses and brands, influencer marketing is becoming the go-to activity for new product launches, spreading their messaging and attempting to grow their awareness via social media. The practice itself, however, is in its’ infancy, and often a brand will understand that they may need to delve into the world but are not sure how to take the first step, or indeed where that path will lead them. At Anicca Digital we have worked with a number of brands and businesses on successful influencer marketing campaigns, and from our experience, as long as you have solid KPIs and goals in place, you can easily measure Influencer Marketing campaigns. Just like any other marketing activity, a plan should be developed prior to undertaking work with influencers. Just like any other marketing campaign, you will need to set a budget for your influencer campaign. There is no right or wrong answer to setting a budget and it is all dependent on the businesses goals and marketing efforts for the year. Influencer marketing should be working in tangent with those efforts. It is often easier to work backwards and to do a little research into how much an influencer will charge you for the activity you would like. You can then work out if you can afford a big influencer, several micro influencers, or a mixture of the two. When choosing an influencer, you shouldn’t always be looking at their follower count, as this can be a skewed measurement due to so many variations. We recommend that brands work with influencers with an engagement rate of 5%. The easiest way to estimate an influencer’s average engagement rate on Instagram is using the Phlanx engagement calculator, which provides an overview based on their last 15 posts. For more information on this, take a look at our Engagement vs Reach piece from a couple of months ago. The goals themselves should be similar to that of existing campaigns and we’ve outlined below some of the most common KPIs that you can allocate to your influencer marketing projects. Influencer marketing doesn’t have to just sit with social media metrics, and can absolutely drive traffic to your website. There are several different ways that an influencer can help with this, and it will all come down to the tone in their content, as well as the level and number of posts they produce for you. To correctly track this activity, we would strongly advise in giving your influencers a UTM code should they be posting on their websites or on Linkedin, Facebook or Twitter. For Instagram it is a little different, the channel doesn’t let you put links into posts, so this is something to bear in mind if you are putting together an Instagram only campaign. There is a common misconception that influencer marketing is solely used for brand awareness. While this is most definitely one KPI you can work toward, it isn’t the only one. Successful influencer marketing campaigns should encourage people to not only interact with your brand but eventually lead to sales or conversions. Much like above, you should be able to track your sales via influencers’ UTM codes. However, as you may be aware, this will not track for those who have remembered and revisited your site at a later date. This is where a unique ‘discount code’ to the influencer would be a great move to include in your campaign. Something as simple as offering an influencer a percentage off code, or giving their audience exclusive direct access to literature or information on your site are a few ways in which you can use codes. These should then be trackable. For some, this is one of the most important KPIs when putting together an influencer marketing campaign. Choosing the correct influencer or multiple influencers is a fantastic way to grow your brand, particularly on social media, and to really start a meaningful conversation with an untapped audience you may never have been able to reach. There are a couple of ways you can monitor brand awareness. The main aim of brand awareness is acquisition. Growing your audience can benefit in all areas of business, from gaining new leads and customers and for connecting with influencers and brand advocates. An increase in new followers directly from influencer activity is one of the most rewarding parts of the campaign, but often it isn’t as simple as that to measure. You can track the increase in followers over a period of activity from an influencer, but there has to be an element of leniency when it comes to this. There is no real guarantee or way of knowing if a follower has come directly from the influencer activity unless of course, they tell you personally. We would recommend influencer activity via social media to be at a time when no other messaging or promotion is being pushed out. One of the best months to do a little influencer marketing activity would be one of your quietest months. Above is an example of an influencer marketing campaign we organised for Deichmann Shoes. 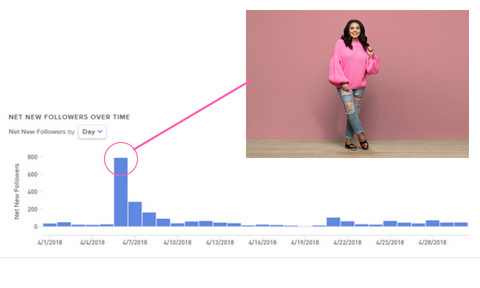 We orchestrated a photoshoot with reality TV star Scarlett Moffatt, who was very on brand for the shoe company, and negotiated several posts on Instagram, and in Scarlett’s Instagram Stories. Above you can see the growth in followers from the very first post that Scarlett set live. As you can tell, this continued for a number of days until it tailed off. We then monitored this for churn/any significant ‘unfollowing’. It would be worth creating your own hashtag to use on social media and pushing this out as part of your influencer campaign. This will then encourage and enable others to click on these hashtags to see who else is talking about your brand or company. You could even reward people for using your own hashtag aside from your influencer campaigns. A lot of retail companies tend to promote their audience using their hashtag by offering a reward or incentive on a monthly basis. This can be a £50 voucher awarded at random to one person who uses the hashtag, or a discount code given to all those who have used your hashtag in a set period. In an ideal world, you’d want a good mixture of these kinds of engagements. It is worth not only monitoring these engagements regularly after influencer activity but keeping an eye on the comments in case you need to provide information to the influencer or their audience. An extra tip. Don’t just rely on influencers to push out your activity and ignore your part in the campaign. There are several things you can do to really boost the campaign.